This Saturday afternoon, our men's team was in the Netherlands for a friendly meet against the Dutch and Italian teams. 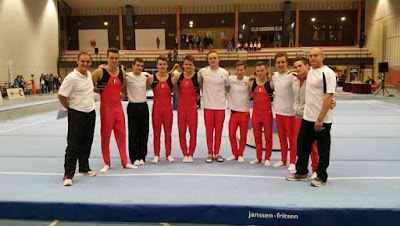 With 338.150, Belgium won a silver medal! There were good things and not so much good things for our team composed by Maxime Gentges (GC Malmedy), Gilles Gentges (GC Malmedy), Thibaut Hoffreumon (La Courtoise), Florian Landuyt (GymFed), Bram Louwije (GymFed), Kristof Schroé (GymFed), Thomas Neuteleers (GymFed), Jimmy Verbaeys (GymFed) et Jonathan Vrolix (GymFed). There is room for improvement and for stability as they had some falls and mistakes. But they also showed very good things: for instance, a 15.250 by Jimmy Verbaeys on parallel bars! Jimmy Verbaeys who took silver in the all around competition with 86.500, a competition won by Dutch gymnast Bart Deurloo (87.800). This result is very encouraging for Jimmy and the Belgian team. With its score of 338.150, Belgium had its best result in this kind of competition. As an comparison, the boys would have placed 16th at last year's World Championships with this result. Obviously, this doesn't mean anything as for today, but this is very promising, just a month away from this year's Worlds (Glasgow, October 23-November 1). Other big news, the gymnasts that will represent Belgium in Glasgow will be named on September 23rd! Those who make the cut will then travel to Italy for friendly meets (October 3 for the Men, October 10 for the Women). They will then pursue their preperation in Arques (France).